This year, Helsinki 2.0 is no longer being presented as an abstract concept with hints and vague statements; Belarus has moved towards developing a more concrete program, whose „concept” has reportedly already been finalized. Minsk has held consultations with representatives of a number of countries, including China, and wants to work closely with leading states and international organizations. Yet despite these claims, the development of this concept still appears to be vague—especially on the key question of how it might succeed where Helsinki 1.0 did not. Can a revamped Helsinki agreement lead to any lasting agreement given that West-Russia tensions have only been increasing given the re-election of Vladimir Putin, the reported poisoning of a former Russian spy and his daughter in the United Kingdom, electoral interference, and so on? 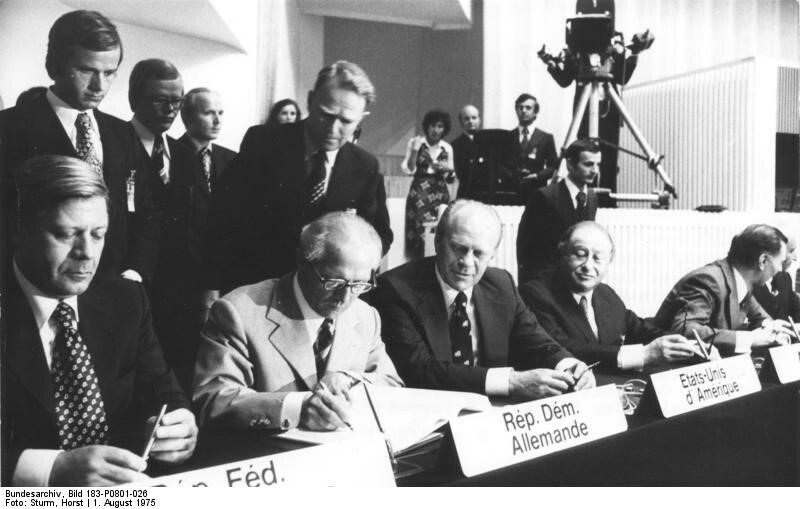 Given that there already are dialogue forums between East and West (of which the OSCE is but one of many), perhaps we need to reaffirm the principles of the original Helsinki Final Act before creating a new one? Is the current geopolitical context really comparable to the original Cold War? To some extent, there are parallels, with a Russian-led bloc or blocs (the Eurasian Economic Union and Shanghai Cooperation Organization, say) on one side, and NATO or the EU on the other. Yet, the contemporary world lacks the ideological tension of the „original” Cold War. Today the lines between east and west are blurred, the „lands in between” (to say nothing of the Global South) have far more agency, and the distinctions far more convoluted/nuanced. While Belarus maintained effective neutrality during the negotiation of the Minsk Agreements, can it really do so (given its close economic and security ties with Russia) if the questions on the table—and the players surrounding it—are concerned with the future of Eurasia as a whole? Moreover, even if characterizations of Belarus as „Europe’s last dictatorship” remain clichéd and inaccurate, the country is still very much perceived as closed and authoritarian by its Western neighbors. Security disruptions and catering expenses perhaps aside, high-level personal diplomacy can be a very effective tool of promoting conflict resolution and is in general a very cost-effective way of pursuing statecraft, and Belarus’ initiative should if anything be welcomed. Nonetheless, at this time, it’s difficult to see how a sequel makes any commercial—or political—sense. The divisions in contemporary Europe may not be as stark as they were during the Cold War, but this only makes a final agreement more—not less—complicated to reach. Barring any unforeseen innovation on the part of the Belarusian side, the best solution for now might be to take the old-school Helsinki Final Act out, have all parties carefully examine it, and then renew their commitment to its preservation–and to ensure that all parties renew their commitment to it: after all, as any collector knows, the best preserved objects hold their value the longest. Next Next post: Thirty years of war over Nagorno-Karabakh: what are the challenges for democracy?